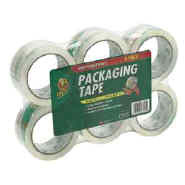 Duck® Brand High-Performance Packaging Tape is ideal for sealing boxes and other jobs. It's clear, 2.6 mil thick and meets postal regulations. Buy in a single roll or pick up a six-pack and save.